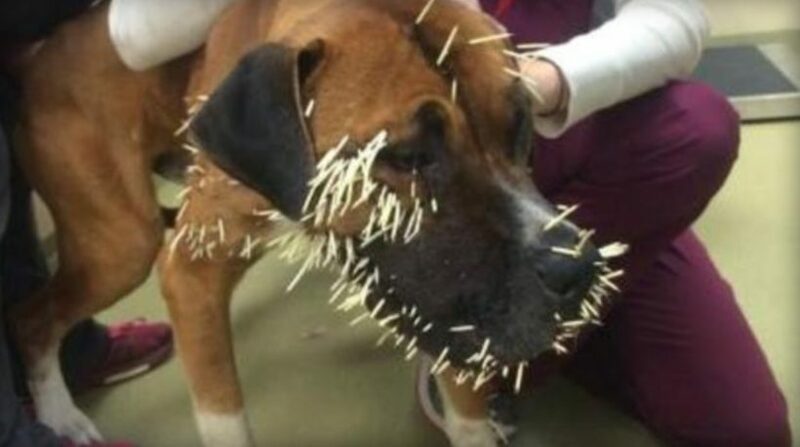 PARKER, Colo.– Canello, a 1-year-old male Boxer mix, had a close encounter with a porcupine, and he had the quills to prove it. CBS Denver reports that animal control officers in Douglas County, Colorado, were able to catch up with the stray dog, but not until he had already gotten a little too close to a porcupine. Canello was first sighted running around on Christmas Eve and spotted again on Wednesday in Douglas County. An animal control officer was able to catch up to him on Wednesday and take him to the Dumb Friends League Buddy Center. Unfortunately, it was after his up close and personal encounter with a porcupine. Canello had quills all over his face and legs. Veterinarians say he will need time to heal, but after that he will need a new family and home, reports CBS Denver. “It appears that he was actually trying to attack the porcupine pretty effectively and he certainly paid the price for it,” Dumb Friends League Chief Veterinarian Jeff Fankhauser said. It has been nearly 40 years since the iconic Super Bowl commercial featuring a kid with a bottle of Coca-Cola, and Steelers legend “Mean” Joe Greene, captured hearts around the world. And now, the pair are reuniting ahead of Super Bowl 50. Greene and an all-grown-up Tommy Okon reunited at a football stadium in Texas, reports CBS Pittsburgh. People Magazine has a clip of the segment which is slated to air during a Super Bowl’s Greatest Commercials 2016 special on CBS. The legendary commercial debuted in October of 1979, but gained its fame after airing during Super Bowl XIV in 1980. “I think the people that created it wrote a great commercial that really tells a story … that commercial’s kind of what Joe is: tough, football player, who’s a nice guy,” Greene said. Greene gets sentimental when he and Okon reenact the commercial in the new video. “Still special, after all these years,” he said. Super Bowl’s Greatest Commercials 2016 will air on Tuesday, Feb. 2 at 8 p.m. ET on CBS.